BillHustonBlog: Kemble of Dimock files $40M Claim against PA Commonwealth + Criminal Charges! Kemble of Dimock files $40M Claim against PA Commonwealth + Criminal Charges! including gross violations of Mr. Kemble's Civil, Constitutional, and Natural Rights. to deny citizens their natural, constitutional, and civil rights. be convened to investigate these charges. with the Secretary of State. determined by PADEP to be contaminated by Cabot Oil and Gas 15 April 2010.
five DEP secretaries, and principally, Mr. Scott Perry, Deputy Sec. of Oil and Gas. stalking, threats, loss of personal income, a $5M SLAPP suit, and chronic and acute health impacts. DIMOCK, SUSQUEHANNA COUNTY(WBRE/WYOU) - Susquehanna County resident Ray Kemble is putting Harrisburg officials on alert with a notice of claim against the commonwealth for $38 million. He says gas drilling by Cabot Oil and Gas caused him injury loss of property value and other issues. "There is no respect for the people, no respect for the land, for the landowners. We have no rights anymore," said Kemble. Kemble also intends to send this private criminal complaint to Attorney General Josh Shapiro, demanding that he complete a criminal investigation into conspiracy allegations by the state and private citizens to poison residents since the first gas well was drilled. The resident claims his water was and still is contaminated due to the Fracking business. He says he has to go to the neighboring community of montrose just to get fresh tanks of water. "I'm tired of the whole thing, we shouldn't have to live like this," said Kemble. His battle against the oil company has been going on for 9 years. Kemble reached a settlement with the company in 2012. It forbids him from talking publicly about the issue. Cabot is now suing Kemble for breaching that agreement. But Kemble says he wants the company and state officials to take responsibility. Kemble is also filing a right to know request to the Secretary of State for the Oaths of Office of the officials named in the criminal complaint. We tried reaching out to Governor Wolf's office and the Attorney General's office for comment. We have not heard back as of this hour. DIMOCK TWP. — A longtime anti-gas industry firebrand found himself at the center of dual spats in the center of town Wednesday where press and supporters assembled for a news conference. 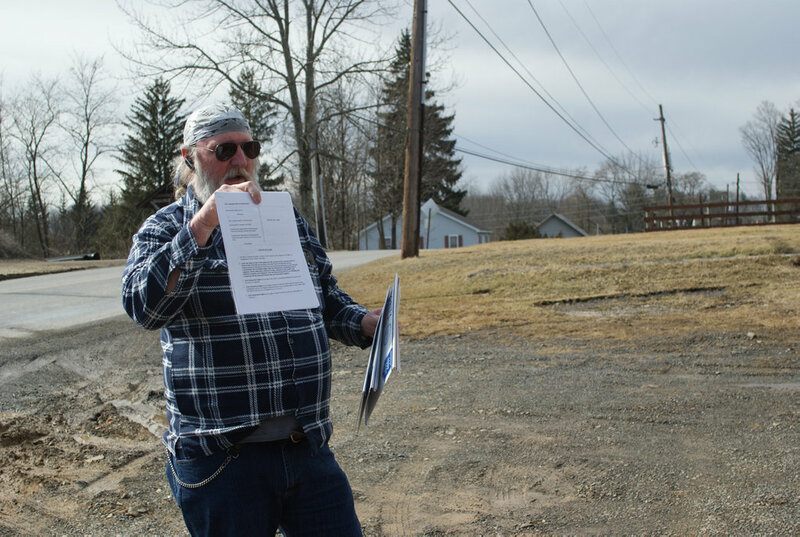 Ray Kemble is sending a notice of claim, a document that precedes a lawsuit, that demands $40 million in personal damages he says were caused by shale well drilling in his community. In documents, which blogger and activist William Huston helped to compose, Kemble outlines damages, including hundreds of thousands in lost wages, legal fees stemming from other lawsuits and pain and suffering among other harms. He's also sending a Right-to-Know request asking for copies of signed oaths of office for 29 state and local officials, and a private criminal complaint accusing state officials and private entities of conspiracy to poison the community. 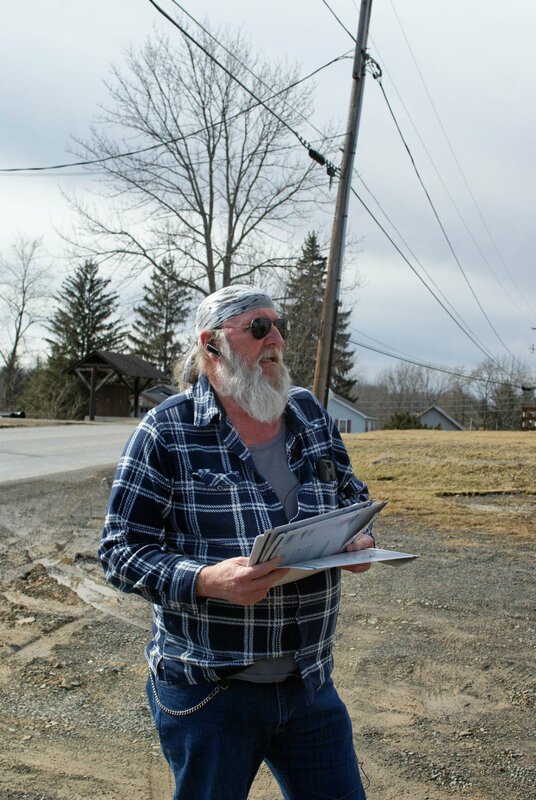 As a half dozen gathered in the parking lot outside the post office along Route 29 in Dimock Twp., property owner Michael Faillace approached to express his displeasure. After debating for a few minutes, the small group relented and moved up the street near the township Municipal Building. There, Susquehanna County Independent reporter Reggie Sheffield challenged Kemble and Huston on the presumed efficacy of their letters. "So you're mailing out a bunch of letters … So what?" Sheffield said incredulously, speaking directly to Huston, inciting a shouting match punctuated by obscenities. In both cases, Kemble stepped back in an apparent attempt to cool tempers while Huston negotiated with Faillace and later clashed with Sheffield. Kemble lashed out against the state Department of Environmental Protection and called on Attorney General Josh Shapiro to fulfill campaign promises to hold the oil and gas industry accountable. "Do your job, what you're supposed to be doing, and protect the people that, you know, basically pay the taxes here and voted you into office," he said. Not having seen the documents, attorney general spokesman Joe Grace said the state's top prosecutor is committed to protecting Pennsylvanians' right to clean air, pure water and preserving natural resources. He noted lawsuits against rule breakers, collaboration with other states and stronger ties with the DEP. In an email, DEP spokesman Neil Shader wouldn't comment on Kemble's claims, but referred to a 2009 consent order and agreement with Cabot Oil & Gas. The department found Cabot's drilling tainted 18 residential water supplies in the area, which Cabot disputed but settled to avoid litigation. Per the order, Cabot paid homeowners twice their assessed property value as part of a package to remedy the contamination. Kemble received $186,000. Keep up the good work Ray!